Shearpoint is a dragon lair located on a small peak to the north of the Throat of the World, between Fellglow Keep and Irkngthand. Its word wall contains all three words of the Throw Voice shout, and is guarded by both a leveled dragon and Krosis, an undead dragon priest. The summit is visible behind Fellglow Keep, and a rough path to the word wall can be followed by heading northwest past the keep and circling round to the northeast. Alternatively, you may head south from Tumble Arch Pass before heading east once the slope becomes easier to climb. Before the dragons' return, the wall is guarded only by Krosis. No additional enemies appear. A toponymous Shearpoint Dragon card appears in Legends. 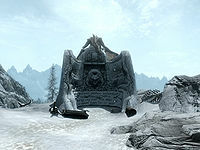 This area might not become cleared, even after you have killed the dragon, the priest, and gotten the word from the wall. Reloading a previous save may fix this. Typing SetLocationCleared 0x0001916c 1 will force the area to be cleared. The word wall will occasionally only teach you one of the three words of Throw Voice. The dragon may rest on the word wall and not move and can't be killed. ? If you learn of this location from gossip, such as a city guard, you'll be able to fast travel to the location, even though you have never been there before. This will cause your "Locations Discovered" stat to forever be off by one. This page was last modified on 10 July 2018, at 17:50.